Enhanced one-piece combination shoulder and upper back padded cushioning for use with the German webbing shoulder harness. This eliminates the need for separate shoulder and back padding and also includes extra spaces front and rear for attachment of webbing items. 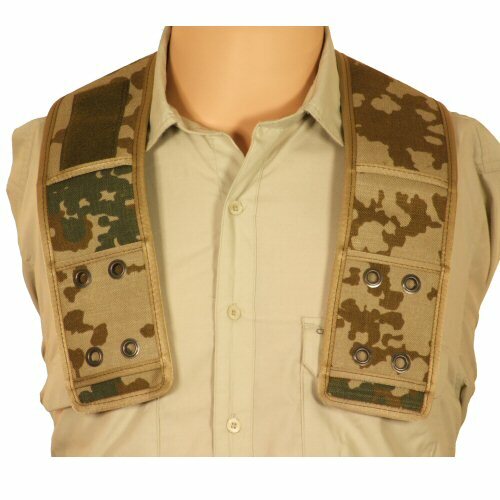 Made of heavy duty IRR flecktarn cordura material, the combination padding has openings to allow the shoulder harness to slide into place and the close cell foam shapes itself with wear. Also helps to give structure and stability to the shoulder harness for ease of putting on and wearing. Also features velcro patch for attachment of rank insignia. Padding does not come with the shoulder harness included; lower picture is for reference only. Made in Germany. 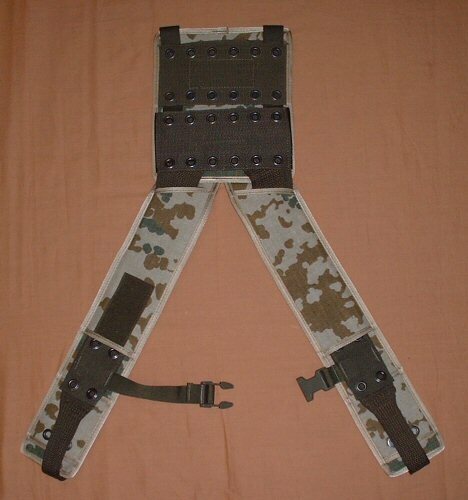 The harness padding shown with a shoulder harness inserted. Shoulder harness is not included.